Excitement abounds in the sports field management industry as preparations take place to ascend on San Antonio, TX next week for the National STMA Conference and Trade Show. The annual networking and education event agenda is jammed packed with speakers and exhibitors who believe grass fields CAN take more! It is jam packed with people who “Think.Different”! There is no doubt new possibilities for natural grass athletic fields will be created through interaction and discussion next week. Growing Green Grass will be in San Antonio with updates and sharing great ideas from the STMA event. Will you be there too? For those of you who are in attendance in San Antonio for the STMA event, please join Growing Green Grass in sharing the possibilities for natural grass fields! When in seminars, having conversations with your colleagues at networking events, or listening to vendors on the trade show floor… share with everyone great ideas that encourage to “Think.Different”!! Tweet those ideas to Growing Green Grass @GrassRevolution with the hashtag #ThinkDifferent. Make sure to include the speaker’s twitter address to make sure to give credit where credit is due! Speakers… share your twitter handle to start your presentation to encourage the sharing of #Think.Different! 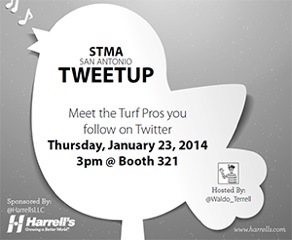 Additionally on the social media/ idea sharing front, Harrell’s is hosting the 1st ever STMA Trade Show Tweet Up! See more on Mr. Waldo Terrell’s (@waldo_terrell) “Front Porch Blog” to learn what a “Tweet Up” even is!! Harrells to Host Tweet Up . Growing Green Grass will be there. Hope to see you there too! This entry was posted in Uncategorized and tagged Green Grass, National STMA Conference, STMA by GrowingGreenGrass. Bookmark the permalink.